2018 has been a good year for Orson Welles. Despite being dead for over 30 years, we’ve seen a couple of fairly high profile documentaries made about him, They’ll Love Me When I’m Dead and The Eyes of Orson Welles, and one of his many incomplete projects, The Other Side of the Wind, has been resurrected and completed. Adding to this celebration of the much-loved director in 2018, the Criterion Collection are releasing two of his films on Blu-Ray in the UK in generously supplemented packages. Eager to fill some of the (far too many) gaps in what I’ve watched of Welles’ filmography, I asked to review the pair. They aren’t being released together in a box set, but with them both coming out on the same day, on the same label, with the same director behind them, I thought I’d group my reviews together. 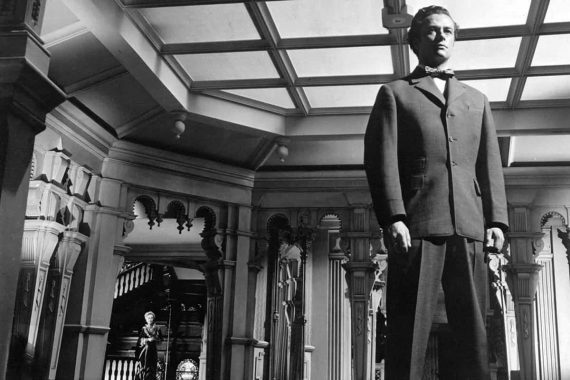 Welles was offered an unprecedented level of control over his Hollywood directorial debut, Citizen Kane, but a troubled release and mediocre box-office return meant that RKO renegotiated his contract for the follow-up, The Magnificent Ambersons. This began a lifetime of problems with studios and financiers for the director, not the least with his sophomore film. The full story is a complicated one and best explained in the overwhelming array of special features included on this disc, but basically the over-two-hours long original cut of The Magnificent Ambersons had a poor preview screening (thought not to have been helped by the timing – America was just entering WWII so downbeat films were not favoured) so the studio wanted to make changes. Welles wasn’t around at the time and proved difficult to get hold of, so RKO put it upon themselves to hack the film up and reshoot sequences to produce what they thought would be a more audience-friendly film. The result was a much-compromised version of Welles’ vision and it still didn’t do all that well at the box office. Unfortunately, the original cut was destroyed, so we’re left with this mishmash of Welles’ genius and RKO’s heavy-handed interference. 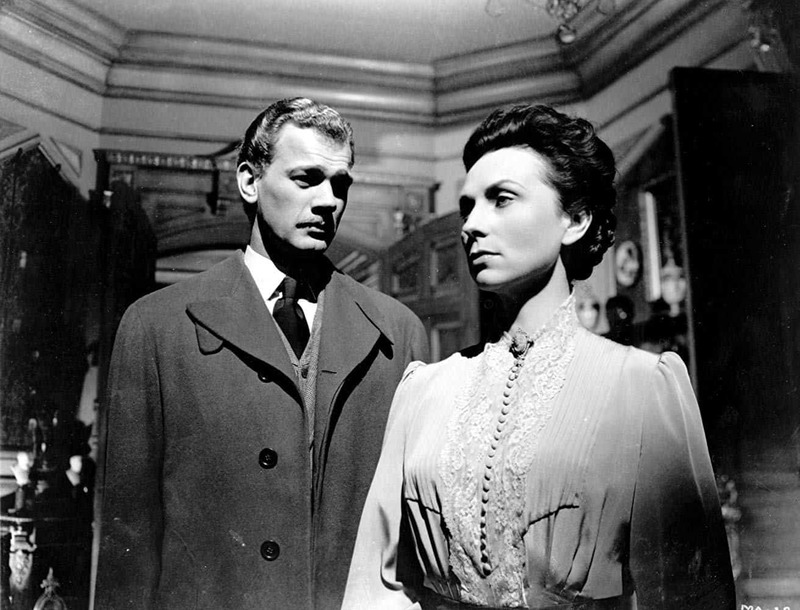 The Magnificent Ambersons is based on Booth Tarkington’s Pulitzer Prize–winning 1918 novel of the same name. It tells the story of the downfall of the titular upper-class family. Isabel Amberson (Dolores Costello) is being courted by inventor Eugene Morgan (Joseph Cotten) but an embarrassing incident turns Isabel away into the arms of stick-in-the-mud Wilbur Minafer, who she soon marries. Jumping forward a number of years, the now widower Eugene comes back to town and attends a party put on by the Ambersons where he meets Isabel’s spoiled son George (Tim Holt), who is approaching adulthood and instantly falls for Eugene’s daughter Lucy (Anne Baxter). She finds George’s arrogance strangely endearing and the two begin a hesitant relationship, but all the while George becomes increasingly unhappy with the attention Eugene is giving his mother, particularly after his father dies. Indeed, Eugene and Isabel begin to rekindle their old flame, much to George’s anger. The insolent young man does his best to intervene over the years, but, in the meantime, the Amberson family stock begins to decline whilst the Morgan family fortunes rapidly increase as the industrialisation of the town (and country) develops. It’s hard to watch The Magnificent Ambersons without thinking about what could have been. However, what is left is still highly recommended. Fresh off the masterpiece that was Citizen Kane, which earned him much critical acclaim, Welles set out to make a very different follow up, but still wanted to pull out all the stops to make a technical marvel of a film, and much of that effort is still there to be seen. Most notably there are some incredible long shots, including a dazzling and complicated move through the huge Ambersons mansion set during a lavish ball. Frustratingly this sequence was to be one long shot but was butchered. Nevertheless, there are enough lengthy stretches to impress and the camera choreography and blocking is a thing to behold. There are also some wonderful static long shots, that allow the actors to impress and make the most of Welles’ famous wide depth of field. The cast are all excellent, with the underrated Holt pulling off a very difficult role. His character is horrible, one of the most unlikeable on-screen protagonists I’ve ever seen, but he remains eminently watchable and never resorts to the histrionics of many straight-up villains. Speaking of histrionics, Agnes Moorehead, who plays Isabel’s step-sister, plays it very big in some scenes, but, in doing so, delivers some of the film’s most powerfully moving moments, particularly her breakdown towards the end (which again was butchered from a supposedly hysterical original single take – only the raw end of it remains). She was the only performer to receive an Oscar nomination for her work on the film. Alongside the admirable qualities though, are many demonstrations of the handiwork of the studio. The end is most obvious, with a tacked-on happy coda that’s clearly not directed by Welles and makes no sense within the story. Throughout though, there are moments that don’t quite settle. This is partly due to the various cinematographers brought on during production and in the reshoots. Stanley Cortez is the only one credited, but he fell out with Welles during the shoot and was fired, only to be replaced by a couple of people during the end of production. The reshoots were shot by a further roster of DOPs, leading to a number of shots not quite measuring up to some of the finest sequences. Perhaps more problematic than any cinematographic anomalies though is the editing. The first half races along and Welles’ mastery of rhythm is apparent for the most part (other than a few hacked up sequences). In the second half though, when the Amberson family truly begins its downward spiral, this strong sense of rhythm is clearly disrupted and the pace and storytelling falters. The second half is much bleaker than the first, which is often rather charming (with some acidic elements), so clearly this latter section was the one RKO most wanted to ‘fix’. As such, you can see much more of their grubby fingerprints on this segment. Bernard Herrmann delivers a wonderful, yet rather uncharacteristic score. It mixes delightful cues with some quite unusual ones. 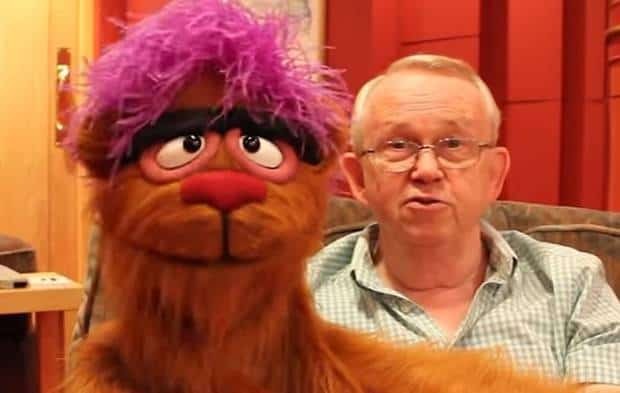 Unfortunately, his work also fell foul to the studio changes, so much was lost and altered, leading to the composer taking his name off the credits. 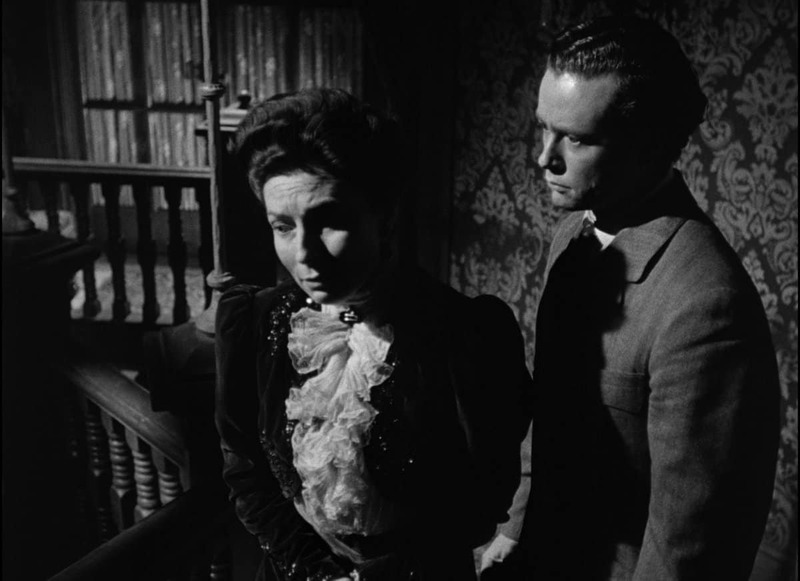 The making of The Magnificent Ambersons is one of the saddest cases of studio interference then, but even in this butchered form there is enough masterful filmmaking from many of those involved, not the least Welles, for it to still be considered a remarkable work. You can’t help but wonder what that original cut was like though and throughout what remains you regularly see and feel the hatchet wounds. 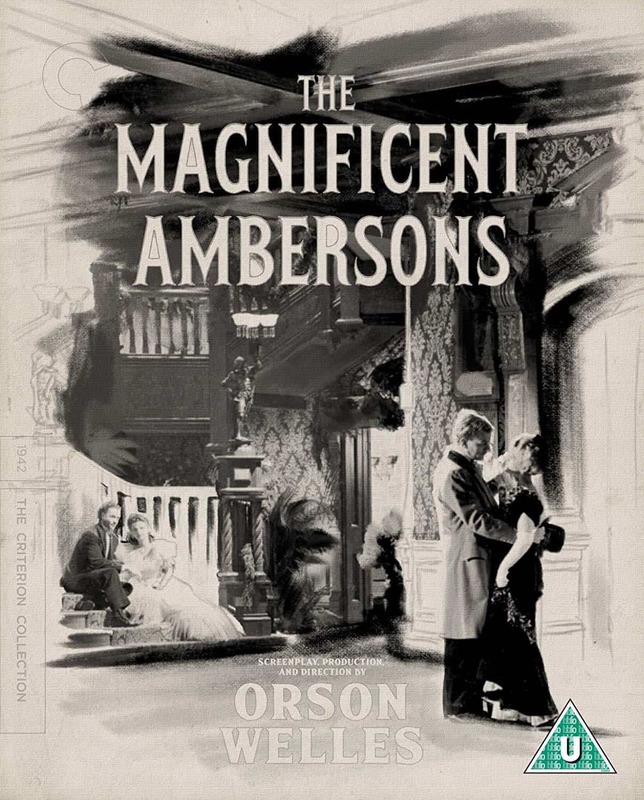 The Magnificent Ambersons is out on 10th December on Blu-Ray in the UK, released by The Criterion Collection. It looks and sounds magnificent (sorry) given its age, with little sign of damage and plenty of detail in the picture, as well as a robust soundtrack. A film that has a history as famously turbulent as Ambersons demands a decent set of special features to supplement it, and Criterion does not disappoint. There’s a huge amount of material so few stones are unturned as the various contributors explain exactly what happened to the film. It’s a sad story that leaves you wondering what could have been. There’s some crossover as you might imagine, but often thoughts and stories are slightly different, so it makes it difficult to get a true answer as to who might be to blame for the hack job done on the film or why it was done. The truly depressing fact though is that next to nobody believes there’s a chance of the original cut showing up, other than a faint, vain hope from one contributor. You never know, stranger things have happened. We can but hope. The Ambersons radio play included here at least offers up an un-meddled-with interpretation of the novel by Welles, but it’s still a truncated version of the story to fit the radio show slot and is scant recompense for film lovers. After his Hollywood projects struggled to achieve financial success, ending with the disastrous Macbeth (which has later been reevaluated), and possibly due to McCarthy era worries of being blacklisted, Welles moved to Europe to work for almost a decade. After a few acting gigs, including The Third Man, he started work on another Shakespeare adaptation, Othello. It proved to be an epic process as Welles, who was also producing the film, kept running out of money, putting the shoot on hold on several occasions. The editing process was slow too and it ended up taking an unprecedented 3 years to complete the project. Othello however, was given a warm welcome at the Cannes film festival, sharing the Grand Prize with Two Cents Worth of Hope in 1952. It took another three years for the film to get a US and UK release though after Welles made more changes to the edit (details of which are discussed at the bottom of this review) and it didn’t find much love there. However, the film has grown to be considered among Welles’ best work now. If you are unfamiliar with the play, it tells of a Moorish general, Othello (Welles), who marries Desdemona (Suzanne Cloutier), the white daughter of a Venetian aristocrat, Brabantio (Hilton Edwards). Othello’s ensign, Iago (Micheál MacLiammóir) is jealous of Othello’s success and angry over his appointment of a younger man, Cassio (Michael Laurence), as his Captain. So he hatches a plan to make Othello think that Cassio is having an affair with Desdemona. Thus begins the downfall of the honourable general. Before I go on to describe my thoughts of the film, I thought I’d get the elephant in the room out of the way first. Playing a Moor, Welles utilises blackface makeup. In more recent years, the role of Othello has always been played by actors of colour, but in the past, before the Civil Rights movement and other advances in equality, it was common practice for white actors to ‘black up’ to play the tragic character. Welles’ Othello was just about on the cusp of when black actors started to be given decent roles in Hollywood films (albeit rarely), so you do get the feeling that if Welles was a little braver (or more concerned with Civil Rights) he could have put a more appropriate actor in the role. The black American actor Paul Robeson, for instance, had already played Othello twice on the stage and Welles himself had put on an all-black production of Macbeth in New York in the 30s. For whatever reason, Welles took on the role himself though and, makeup aside, does a damn fine job of it. Also, presumably due to the blackface issue, Welles downplays the racial aspects of the play. I don’t know the original text that well personally, but from the mountains of supplemental material included on this disc, I learnt that Welles cut a number of lines and scenes that further accent the character’s ethnicity. In doing so, the film feels to be more purely about jealousy than racism, which is a sensible move, given its white lead actor. In general, Welles’ distillation of the play is highly effective in delivering a powerfully stripped back production. This approach may be down to the budgetary problems the director faced, but nonetheless, the sparse look and clear focus make for a bold and approachable take on the Bard. I’m not a Shakespeare expert myself, so sometimes struggle to get into adaptations that make use of the original language, but after a tough start (not helped by some unclear dialogue) I soon tuned in to the style of the prose. It’s quite a simple story at heart, particularly here in a slightly truncated form, so it’s accessible and emotionally effective, rather than merely academically interesting. 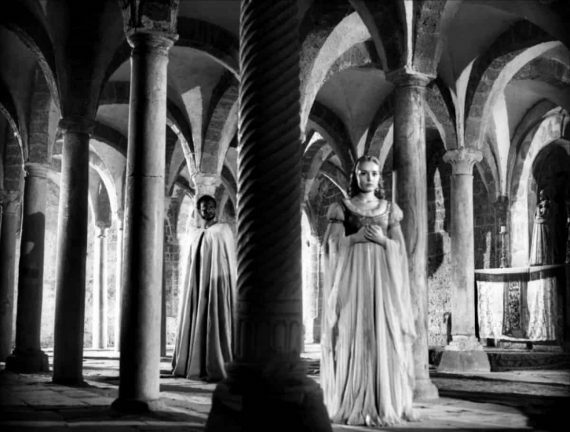 There’s an ominous sense of foreboding over the film too, as it opens with the funeral of Othello and Desdemona, so you know where the story is headed from the offset. The low budget does make for some poor effects shots used to show a nearby ship and the lack of big crowd scenes highlight the independent nature of the film. However, I believe the sparse nature of the production design caused by the budget helps the film’s atmosphere. Speaking of atmosphere, the most clearly outstanding aspect of the film is its striking visual style. Welles was often known for his long takes, full deep-focus frames and graceful movement, but here scenes are relatively quick-cutting (other than one or two notable sequences). His shots are no less impressive though. 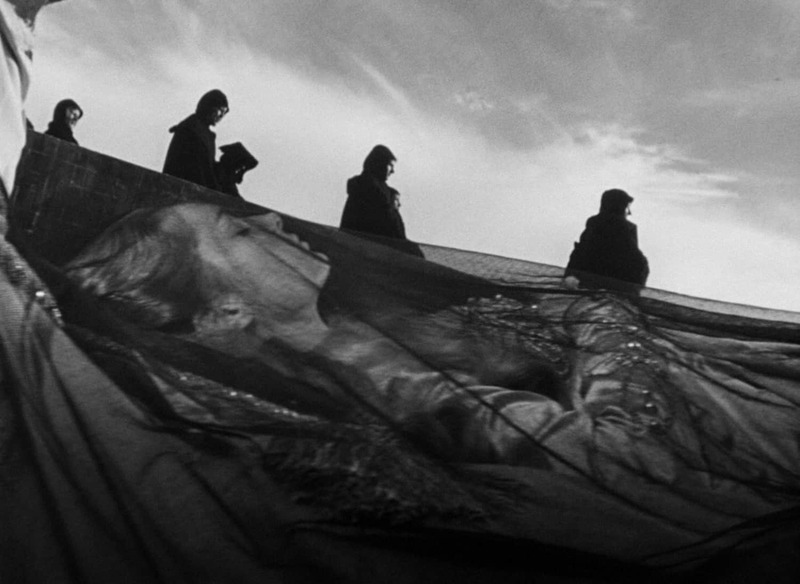 Making wonderful use of contrasting blacks and whites as well as bold lines within his frames, the film is astonishing to look at. The low budget does lead to a few focus issues here and there, but these can be forgiven when the lighting and framing are so strong. There are post-sync dubbing issues due to Welles favouring the quality of lines over their timing with the visuals. Being an Italian production, this is a common occurrence though, as filmmakers in that country were less concerned with technical perfection as they were and still are, in the US. It may be distracting to some and was a subject of criticism aimed at the film on its original release, but if, like me, you’re accustomed to this through watching many spaghetti westerns and giallo, it’s not really a problem. Overall then, it’s a striking and powerful Shakespeare adaptation. It’s rough around the edges at times and his decision to take on a role better suited to a black actor is questionable, but Welles did a remarkable job under the circumstances and once again proves why he’s so highly regarded as a director and actor. 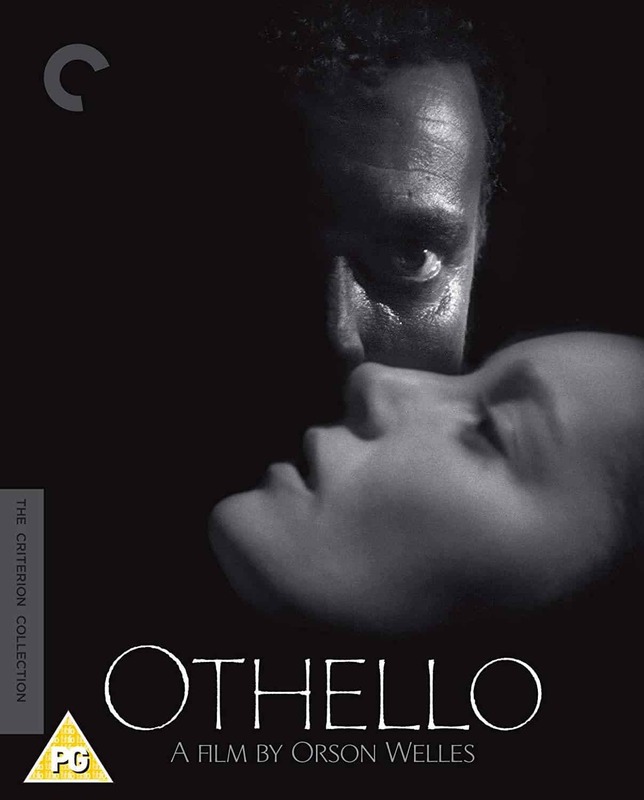 Othello is out on 10th December on Blu-Ray in the UK, released by The Criterion Collection. Two versions of the film are included and they both look very good, with only a few hints of lines on the picture. I only watched the 1952 version all the way through and found the audio a little murky at times and not always 100% clear, but I think that was down to the original recording rather than a weak remaster. It’s an astonishing set of extra material. 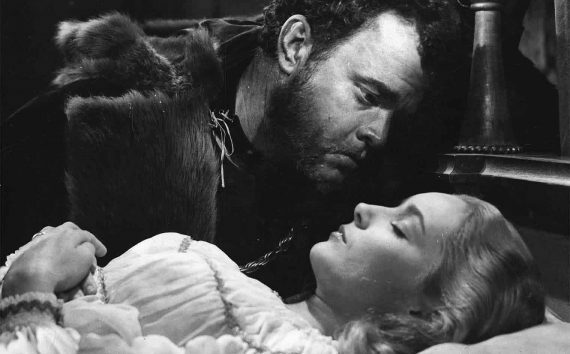 Filming Othello is the biggest draw, as it’s actually a complete extra feature film, once again directed by Welles. It features him delivering a largely academic dissection of the play and how he approached it on film. 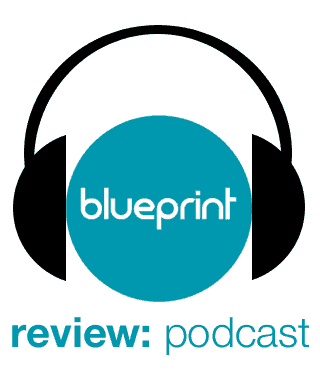 There’s a fascinating and fairly lengthy section where he sits with two co-stars of Othello, Hilton Edwards and Micheál MacLiammóir, who are both theatre veterans, and they discuss Shakespeare’s work in great detail, particularly the themes of the play. There’s also a segment taken from a Q&A in New York. It’s not a film that will easily appeal to those not interested in Shakespeare or filmmaking, but Welles is a compelling narrator/presenter and throws in some enjoyable anecdotes about the difficult production. And that’s only one of many fine special features. The commentary is fairly dry and academic but rich with detailed analyses of the film. The other interviews do a great job of covering specific bases of the film’s background and post-production history. It was a particularly smart move to have a separate featurette on race issues with the play, so they are covered directly and in reasonable detail. Plus you’re getting two versions of the film, as mentioned before. The 1952 version is what played in Cannes to great success, but Othello didn’t reach cinemas in America and the UK until 1955 in a slightly altered cut with a drastically different soundtrack. Most notably, Desdemona was completely re-dubbed by Gudrun Ure and Welles re-recorded a large portion of his dialogue too. Some may argue this improved those performances and it was Welles himself who made these changes, but concessions were also made in this cut by adding some explanatory narration, so it’s open to debate as to which version is definitive. You should watch both really. Unfortunately, I didn’t have the time, but the François Thomas interview does a good job of explaining the differences and why they might have happened. It might have been even more interesting to have the controversial 1992 restoration too, but that’s often seen as a bastardisation of the work. So, it’s an incredibly comprehensive package for a great film and comes highly recommended.